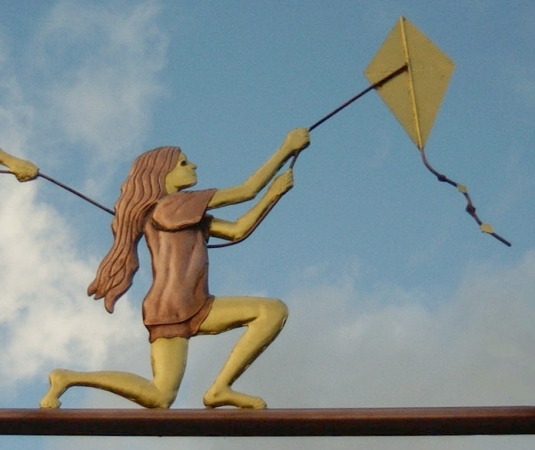 The Children Flying A Kite Weather Vane shown here was commissioned to be constructed in copper with optional gold leafed accents. Over time, copper will naturally weather a dark chocolate brown before eventually turning a lovely turquoise green (like the Statue of Liberty). 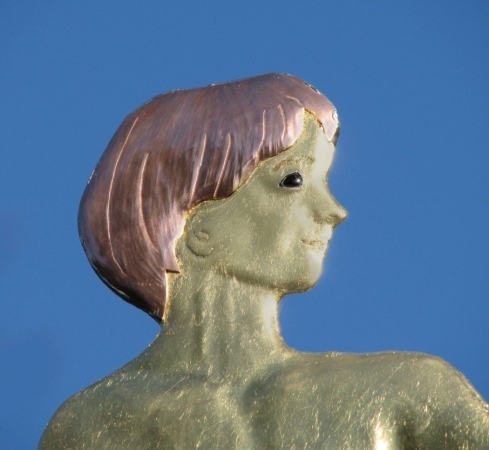 The gold stands in luminous contrast to the copper and is especially effective when your weathervane is viewed against a visually competitive background such as trees, a hillside or other structures. We have crafted several variations on this particular sculpture piece, transforming it into a portrait weathervane, based on photos sent to us by parents or grandparents. Because we do not use molds, personalization of each weathervane is standard procedure. Our artisan crew shapes each of our weathervanes by hand with rawhide hammers over oak posts. Years of practice go into hand shaping anatomical features, such as stomach muscles and cheekbones, into flat sheet copper. Our highly skilled vane makers have been through a rigorous Apprenticeship Program which includes taking arts based coursework at our local community college (including Life Drawing and Modeling) as well as mastering weathervane making techniques in a step by step program here at our studio. 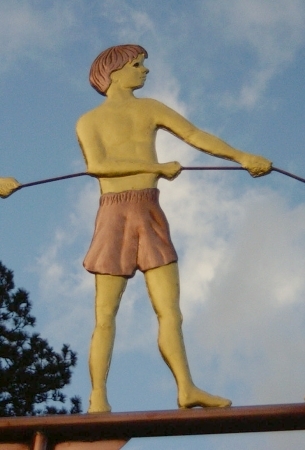 The average West Coast Weather Vane apprenticeship lasts about 18 months. 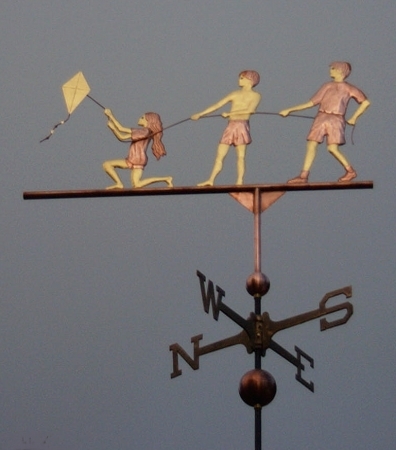 All of our current weathervane makers have been with us at least 17 years and long ago passed through the Journeyman stage of their apprenticeship and are now considered Master Level Craftsmen. 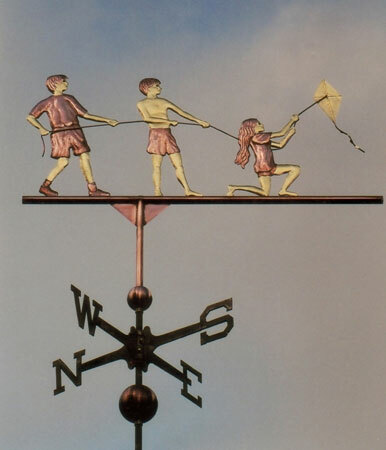 A favorite aspect of personalizing this weathervane to represent actual children is to take advantage of the weathervane tradition involving a ‘lucky’ penny. 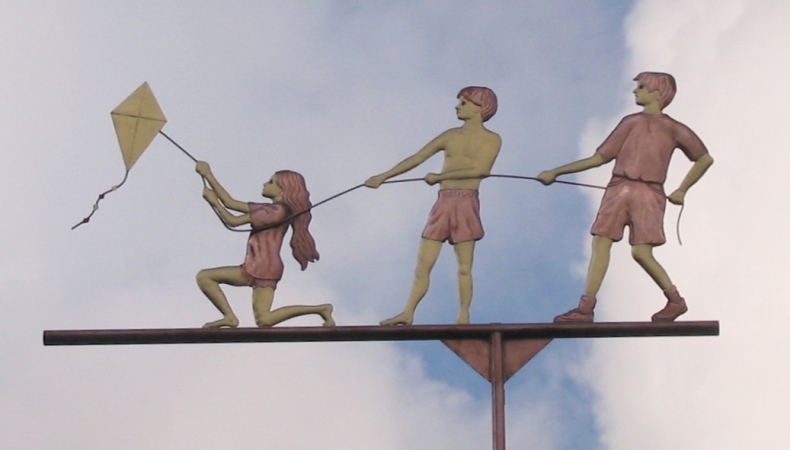 The original Victorian tradition included a penny from the year the weather vane was made inside the sculpture piece. Our variation on this tradition is to also place a ‘lucky’ penny from the birth year of each child inside their respective figure. Because copper is nonferrous, it is possible that these weathervanes may still exist a hundred or even a hundred and fifty years from now. If handed down from generation to generation as a family heirloom, these ‘lucky’ pennies will be a part of the weathervane’s lore.